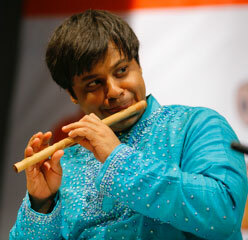 A Grammy nominated exponent of the Flute, Shashank stormed into the music world at the age of six in 1984. He was the youngest musician to have been invited by The Music Academy, Chennai to perform the senior most slot of The Music Academy. Trained by father Subramanyam and vocal maestros R.K. Srikantan and Palghat K.V. Narayanaswami, he is presently considered one of the best Bamboo Flute artists and is hailed so by the Indian and international media alike. The BBC World TV telecast a documentary on Shashank titled “Destination Music”, recently. Shashank often collaborates with many legendary musicians from India and around the world including Guitarist John McLaughlin, Tabla Maestro Zakir Hussain, Ustad Sultan Khan, Pt. Vishwa Mohan Bhatt, Pt. Ajoy Chakraborthy to name a few. Shashank has enthralled audiences in concerts at Rashtrapathi Bhavan (The President’s Palace at New Delhi), Skopje Jazz Festival – Macedonia, The Smithsonian, Kennedy Center and National Academy of Sciences in Washington D.C., J. Paul Getty Hall -Hollywood, Cerritos Performing arts center in Los Angeles, Eastman School of Music – Rochester, World Music Institute – New York, Asian Art Museum – San Francisco, Xebec Hall and Across Fukuoka in Kobe and Fukuoka, Japan, Hong Kong Museum of Art – Hong Kong, World Flute Conference – Nashville, Theater De- La-Ville, UNESCO & Musee Guimet in Paris -France, Tropical Institute – Amsterdam, The Lowry in Manchester-UK, The Sage in Gateshead – UK, Modigliani Hall -Padova-Italy, Museum Rietberg -Zurich, The Munchen Residency in Munich-Germany, The Adelaide Festival- Australia, Improvisation Festival in Lausanne- Switzerland, Seoul Plaza in Seoul- Korea and a host of other prestigious institutions across the world.